The post SPS Strength & Speed Camp appeared first on Razor Sharp Fitness Club Racine WI. The post Member Spotlight, Julie Semrad appeared first on Razor Sharp Fitness Club Racine WI. The post Summer Shred Throwdown appeared first on Razor Sharp Fitness Club Racine WI. The post Personal Trainer Tip appeared first on Razor Sharp Fitness Club Racine WI. The post 20/30 Wellness and Weight Loss Program appeared first on Razor Sharp Fitness Club Racine WI. The post Massage Therapy appeared first on Razor Sharp Fitness Club Racine WI. Relax and Sooth Muscles with a Massage! We all lead very busy lives, so it’s important to take care of ourselves. Massage Therapy can have profound effects on your physical, mental and emotional states. Razor Spa offers a variety of massages: Swedish, Deep Tissue, Myofascial Release, Prenatal, Sports, and Table Stretching. Amber Black (LMT) received her certificate in massage therapy from Anthem College in Texas. She has more than six years of experience in the field. She has a thorough understanding and experience in multiple modalities including deep tissue, sports massage with stretching, Swedish, myofascial release, trigger point, and pre- and post-natal massage. Amber believes that we need to give our bodies all the tools to heal itself through preventative care like massage, yoga, meditation, exercise and healthy eating. For more information or to schedule a massage, call (262) 321-0200. The post Swim Lessons appeared first on Razor Sharp Fitness Club Racine WI. Swim Lessons are Back at the Razor Pools! Last month, Razor Sharp welcomed swim instructor, Sherre Chevalier, to the team! Sherre has recently moved here from Albuquerque, New Mexico. She swam competitively for 14 years and was a multi year state qualifier and member of the 2013 New Mexico High School State Champion team. She also played water polo for many years and was one of only seven members of the New Mexico 1st All State team. Sherre is still active in the aquatics world. She was a lifeguard and pool manager for over 7 years. 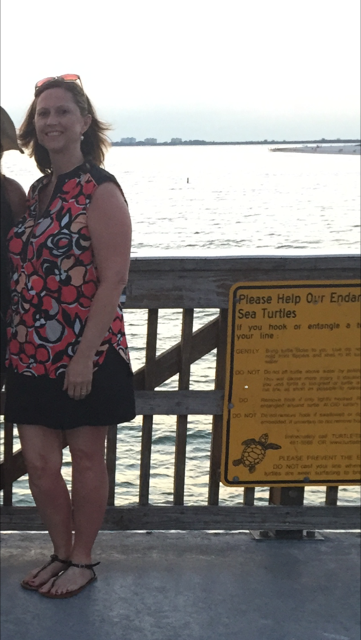 Sherre has over 8 years of swim lesson experience and enjoys teaching a variety of ages. She believes it is never a bad time for anyone to learn to swim! At our facility, all ages are invited to learn how to swim. Youth swim lessons are available for those 13 years old and younger. Swim lessons are a great way for children to build confidence and learn how to safely have fun in the water! We also have adult swim lessons, which are available to those 14 and older at all swimming levels: beginning, intermediate, advanced, competitive, and triathlon swimming. Swim lessons can be private or semi-private. For more information or to book a swim lesson, contact Jacob Thomas at jthomas@razorsharpfit.com or (262) 321-0200. The post Tabata Group Training appeared first on Razor Sharp Fitness Club Racine WI. Razor Sharp will once again be offering Tabata! Tabata is a high-intensity interval training method originally created by Japanese researcher Izumi Tabata. It is simple to understand, easy to apply — and one of the most WICKED-effective cardio-/metabolic-conditioning programs invented. This program is scientifically designed to be the hardest and most fun workout you’ll. Ever. Do! If you want extra motivation — Tabata is for you. If you need a solution for workout boredom — Tabata is for you. If you’re not seeing the results you hoped for — Tabata is for you. If you like working out as part of a team — Tabata is for you. Tabata’s popularity comes partly from the scientific evidence showing that it is a superior training method to traditional cardiovascular training. Beyond that, who wouldn’t prefer better results in just 4 minutes compared to 60 minutes of traditional cardio exercise? Lose weight or reduce fat — studies have shown that high-intensity training results in EPOC, Excess Post-exercise Oxygen Consumption. See that graph farther up the page? Yeah, that’s EPOC in action. In layman’s terms, this means that the metabolic effect of exercising at high intensity can continue long after the training session ends, resulting in more calories being burnt, even while you are resting! See results with less workout time — busy people without a lot of time to spend in the gym can apply Tabata to ensure that they maximize the efficiency of their workouts, getting better results than traditional methods in substantially less sweat time! 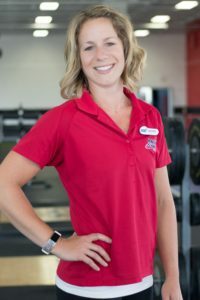 The post Personal Trainer Tip: Lauren Gedemer appeared first on Razor Sharp Fitness Club Racine WI. The Reality: It doesn’t matter what time of day you eat. If your body needs the calories and energy, you can eat any time of day you’d like. The foods you eat don’t know what time it is, so eating them between 7am and 7pm is no different than eating them between 8pm and midnight. Some studies even show that eating a healthy snack before bedtime can help you sleep better and may be beneficial to weight loss. The quality of the foods you consume is what’s most important. Try not eating too much sugar or too many simple carbohydrates before bedtime. These items inhibit Human Growth Hormone (HGH), which is generally produced early on in your sleep cycle. HGH is known for burning fat and building muscle among other things, therefore increasing the insulin produced by high blood sugar right before bed could be counterproductive to the healthy changes you’re trying to make at the gym and at home. Try choosing something with complex carbohydrates like whole-wheat toast, or popcorn. These items take longer to breakdown and can help control the blood sugar spikes or crashes you want to stay away from. In short, if you keep an eye on the foods you’re consuming and continue with a regular exercise program, you can eat whenever your body needs it – even if it’s a snack right before bed! 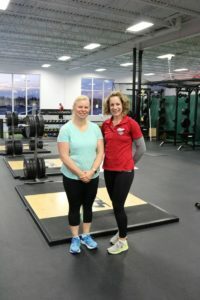 The post Member Spotlight: Shelly Mumm appeared first on Razor Sharp Fitness Club Racine WI. 2017 held two big “events” for me: My 50th birthday and my husband, Dan, and I became empty nesters. Dan has always been very disciplined at exercising every night with equipment we have in our basement, but I, on the other hand, not so much. I knew I needed to move more (I sit all day for work and all of my hobbies are sedentary ones), get healthy, and lose some weight as diabetes, hypertension, and hyperlipidemia all run in my family. Also, with our boys both leaving for college we were looking for activities we could do together. Joining Razor has helped me accomplish both of those goals. After talking to one of our neighbors, we toured and joined Razor. I was matched with Lauren Gedemer as my trainer for my Kickstart appointment. I immediately was impressed by the gym and by Lauren. She took a complete medical history and we talked about my personal goals. 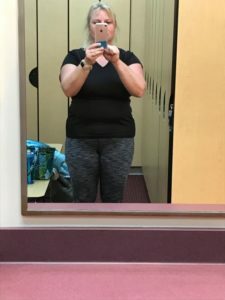 I find going to a gym and exercising in front of others to be a bit intimidating and feel very self-conscious, but everyone at Razor has been so friendly and seems to genuinely care about their members that I no longer have this problem. I felt I needed the extra instruction and signed on for some personal training appointments. Lauren is awesome! She is very knowledgeable and supportive. I love the time I spend with her! I have become stronger and fitter than I have ever been or could have ever imagined I would become. Dan is always very supportive of me and together we started going to Group Power 3 times a week, yoga once a week, and also began checking out equipment available, along with the pool. For the first time in my life, I have stuck to an exercise program and have come to enjoy my time in the gym. 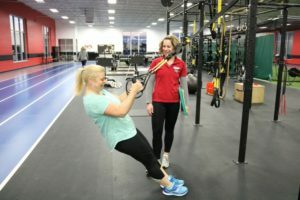 I have been a member since April 2017 and have kept up the pace pretty consistently with the most recent addition of a Wednesday workout by joining the group exercise program called Lose it For the Holidays. The benefits I have gotten from the exercise and gym membership have been incredible. I have a lot more energy and overall just feel so much healthier than I ever have. I have had such a difficult time in the past losing weight, but have now lost almost 30 pounds since April, along with lots of inches and body fat. I just had my lipid panel repeated last month and everything: cholesterol, HDL, LDL, and triglycerides are “normal” for the first time in my life. I have made permanent lifestyle changes and am enjoying both the activities and the results. It is a very difficult change to make (adding regular exercise) and does help when you start seeing positive results. I am not yet to my goal weight, but I feel like I will get there for the first time in my life due to the support of my family, friends, and my new friends at Razor! I am a prime example of the old saying: “if I did it, anyone can do it.” I went from excuse ridden couch potato to fit and healthy!